No sooner does one ship move out of Fincantieri's Marghera yard than another begins to form. 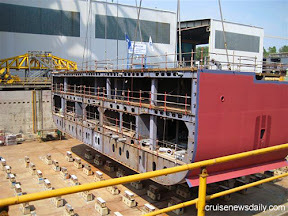 The keel has been laid for Costa Deliziosa, which will become the 15th member of the Costa fleet when the ship enters service during the spring of 2010. The 328-foot section was built at Fincantieri's Ancona yard and towed to Marghera near Venice. The 92,700-ton Costa Deliziosa will be a sister to Costa Luminosa, scheduled to enter service next June. This article appeared in Cruise News Daily on July 7, 2008.